Over the last year we’ve been reminded (perhaps more than necessary) that sharks pose a clear and present danger. Videos like “Me, my shark and I” by Chuck Patterson, touristy Cape Cod beach closures due to Great White sightings, and the unfortunate death of a UCSB student at Surf Beach are responsible for my conscious blaring: the sun has set, everyone is out of the water, why am I still surfing? Let’s not forget that these instances can happen in the absence of surfers, go-pro cameras, or real media coverage. 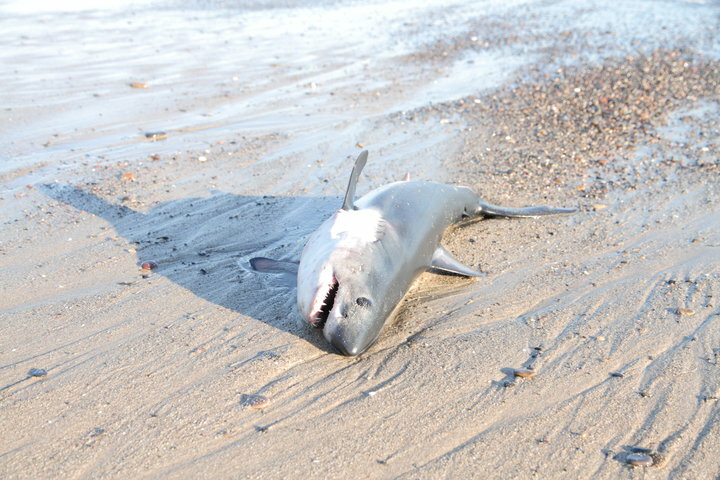 On January 20th, construction workers were caught off guard when a Great White shark beached itself on shore at a construction site in Malibu, CA. A few bystanders approached the shark as it snapped and nashed its teeth violently. Happening in a matter of moments, no one was hurt and the shark was able to swim away. The photo here is one of two that were taken. We all have different coping mechanisms when it comes to sharks. Maybe you’ll ignore the amazing creatures all together. Others will stay away from certain surf spots, decline on sunset sessions, or opt out on paddling the channel for epic tubes at South Straddie. Or, in true American style, you can always just buy something to chase away your fears: shark shield, shark repellent, or shark camo. The choice is yours. Firstly, you have more chance of ntetigg hit by a car or killed by a coconut falling on your head than ntetigg attacked by a shark. A shark isn’t going to pick you by what colour your boogie board is. Usually they attack people who have just gone to the toilet or are simply the unlucky ones. I think Mythbusters found that sharks are not attracted to certain colours but they tend to bite the colour yellow more once they do attack. Dont worry about them though, they aren’t an issue! Just pick a cool bodyboard! Hmmm… Whatever kind of shark this is, I would still rather keep my distance. Respect! Ever since I can remember I have tawned to see a blue, how lucky you are to have seen 5. Oh I’d love to get certified and dive with the whales and dolphins. Salmon Shark. You can make out the spots on it’s under-belly which grow darker as the fish matures. We are in Maine and have plenty of scerous available. I have a friend that has taken me out once that I can get certified with, it’s time, money and on my list to get to. Maybe by the time we get a chance to see you when we’re out with Nate and Jess. Hi Sheree,Don’t know where you live but even in the midwest I have run osracs scuba diving shops, so jump on the internet find that place and get certified! The U.S. Navy found that the color most easily seen from the air for ritelaffs, was also the color most easily seen by sharks, so it got the nickname of Yum Yum Yellow . I think that is when ritelaffs started appearing in orange. So I would think a dark orange would be a good choice.Sharks in the surf are very rare. When near they are very visible from the air, and West Coast beaches get a lot of fly overs. That is a salmon shark. They beach themselves this time of year. Google it, or ask Sean Van Sommerman the shark expert. We found one up here in Santa Cruz about 2 weeks ago. Too small for a juvenile great white. Shark is a Great White. Snout is blunt. Mako’s are pointed. That looks more like a mako to me. It would also make more sense that it is a mako since they can reach far greater speeds, making it easier to beach themselves – especially that far beyond the waterline.